Visceral and eclectic choreography took center stage October 9-11 at Velocity Dance Center’s annual Made In Seattle program. This year, the double bill included performances crafted by Babette DeLafayette with John Marc Powell as well as Anna Conner + Co. Both companies have often been hailed as “experimental,” creating pieces that blend performance art with as much visual rigor as there is kinetic. Made in Seattle was no exception, though both groups also left more to be desired. DeLafayette and Powell’s separated from the womb we became lions opened the show. Six dancers, each wearing a black mask and a tutu-like skirt made of plastic, entered an arena encircled by plastic sheets hung from the ceiling. Here, DeLafayette and Powell created an intriguing world based on contrasts. 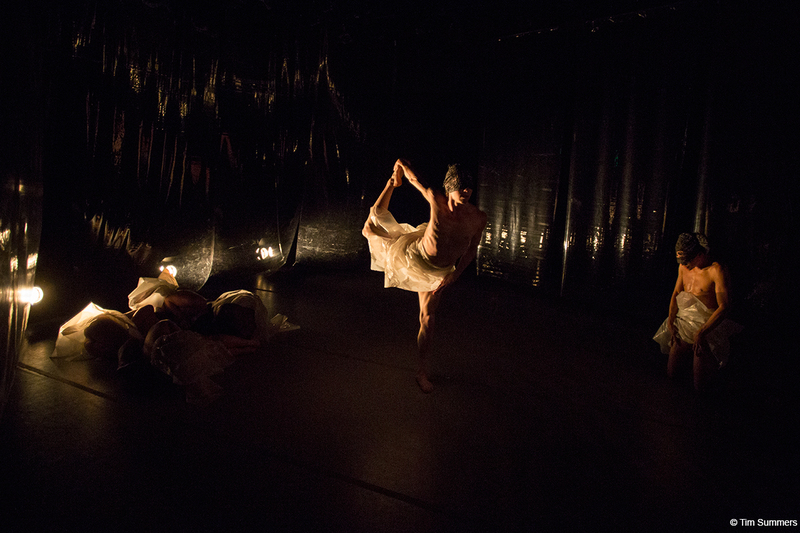 While many elements—the plastic costumes, set design, and the atmospheric and drone-like sound score—suggested a hyper-synthetic nature, interactions surfaced organically between the dancers. They shifted between sinister solos and neurotic herd mentalities as a series of duets and trios emerged, some tender and knowing, some violent and physical. DeLafayette created a movement language that provided a primal and animalistic counterpoint to the slick artificiality of the other elements. Their fluttering fingers, head bobbles, and stuck-out tongues, combined with the dancers’ grounded quality transformed these humans into distorted swans. The performers—Jim Kent, Markeith Wiley, Elby Brosch, Marlys Yvonne, Sean Rosado, and DeLafayette herself—were standouts in their own ways. A particular highlight was a duet between Kent and Rosado. They zoomed from one side of the arena to the other, sometimes lifting each other just slightly above the ground. Their limbs alternated between slashing and floating, but all the while they electrified the field around their bodies with their energy. Yet, something seemed missing. 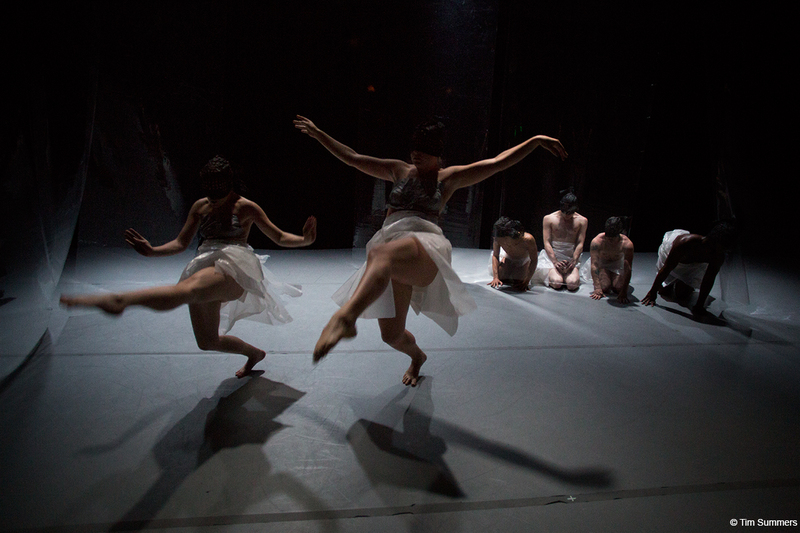 The promotional materials for separated talked about “activating the somatic, haptic, optic and sonic to expose the body and its vulnerability in our cybernetic world.” Sure, the performers’ bodies were exposed, suggesting physical bareness, but very little genuine vulnerability—or humanity—emerged. While the synthetic sets and costumes embodied the realistic cybernetic world DeLafayette and Powell intended, seeing these visual elements together created an intense peak early on in the work’s arc. Unfortunately, the movement didn’t support this visual climax, and the work plateaued without creating conflicts or resolutions. 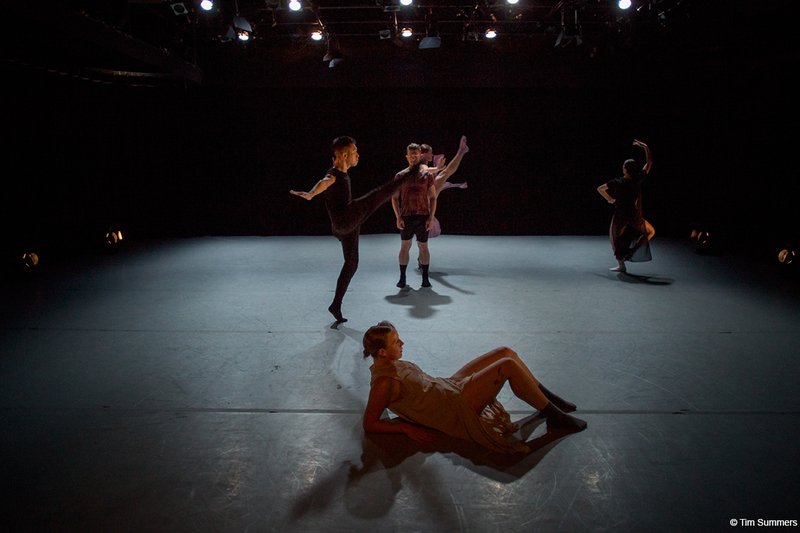 Following intermission was Anna Conner + Co’s Exercises for the unrested: the kingmaker, featuring Patrick Kilbane, Alexander Pham, Calie Swedberg, Cait Wyler, and Hannah Simmons. It started as a meditation of sorts, with each dancer moving ever so slowly in their own horizontal path, each embodying a different character. Kilbane, a featured dancer in unrested, progressed diagonally across the stage, regally balancing on one leg with each step as the opposite leg scanned the air around his body. Kilbane in particular has a gift for capturing attention with the slightest change of his body and expertly shifting between movement rhythms; unrested showcased this gift to mesmerizing effect. This anxious meditation disintegrated as each dancer’s character fell off a proverbial precipice and into chaos. The droning music by ONE and Moped Genius, helped develop tension, which broke as the dancers all shifted into a regimented, high-powered, almost cardio-like series of kicks, bounces, and head drops. The high point of this exploration came during a slinky yet urgent duet between Kilbane and Pham, where they alternated between blade-sharp edginess and taffy-smooth placidity as they burst through space. After all the chaos, the performers returned to their initial meditative qualities, though each now occupied another dancer’s pathway. Conner’s knack for carving space and exploring contrasting compositional dynamics shone throughout the piece. Many elements of unrested felt disjointed even with the work’s cyclical structure. Some of the movements—except for Pham and Kilbane’s duet—appeared clunky instead of dynamic due to disconnected transitions between gestures. Swedberg, Wyler, and Simmons’ costumes (long sheer dresses with slits on both sides, selected with help from costume consultants Annie Price and Julia Eckles), felt like they had no purpose other than the fact that it made the dancers’ regimented bounces look slightly more interesting. Kilbane and Pham were dressed in casual pedestrian outfits. The contrast in costumes suggested a different world for the men and women, which was never addressed choreographically. Despite virtuosic performances by the dancers, and the production support all the artists received, something still felt lacking from Made In Seattle’s double-bill. Many of the show’s promotional materials talked about exploring interactions affected by an increasingly digital world, yet neither genuine relationships, nor commentary on the absence of those sincere interactions, ever emerged. Hopefully, with the support and attention these artists have been receiving, these topics will continue to incite fruitful research. More information on Velocity’s residency programs can be found on their website.